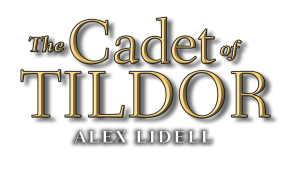 Welcome to this stop on THE CADET OF TILDOR online scavenger hunt. If this is your first stop in the scavenger hunt, please go here (http://cadet.alexlidell.com/scavenger-hunt/ ) to learn how to collect all of the online clues that will lead to fun, prizes, and more! Don't forget, you have until midnight (eastern standard time) on Mon. Nov. 12, 2012 to enter the grand prize drawing. Good luck! Fine. She skipped the salute and went for his throat. The throat moved. And continued moving. The harder she swung, the more Savoy slid, his very lack of force mocking her efforts. An urge to hurt him suddenly gripped her, and Renee threw her whole weight behind the blows, aiming for his ribs, his thighs, his hurt shoulder. If a blow connected, just one, just once, he’d feel her worth, her potential, he’d know she belonged here. Notes: My editor took me by surprise when she chose this excerpt for the back cover of CADET. I had not thought of it but thought YES when I saw it in the email. This short tidbit gets to the heart of Renee’s emotions. She is the only girl left in her class, under threat of expulsion, and is fighting for all she is worth to prove her worth. While I can’t speak about the larger story without spoilers, I’ll tell you that this exerpt comes after an intense event. Savoy, Renee’s teacher and the medieval fantasy equivalent of a special forces commander, had been injured - which is why he is switching his sword hands in the opening paragraph. Renee herself is shaken up. You will notice that in her desperation, Renee is breaking military etiquette. Undress stress, when we don’t have the mental and emotional resources to school our faces and actions as we usually would, the rawness of true feelings becomes easier to see. And Cadet Renee de Winter is a fighter and a swordsman - and here she is desperate to regain herself. ** fine print: Grand prize mail is for US only. If winner is international, the prize will be changed to a pre-order or THE CADET OF TILDOR through Book Depository. At least 100 entries necessary to trigger the giveaway. First 20 to the finish line prizes are US only. Also, if you haven't done so, check out my page dedicated to recruiting new Tildor Heralds members. Join The Tildor Heralds Street Team! This is a GREAT snippet!!! Thanks for posting!